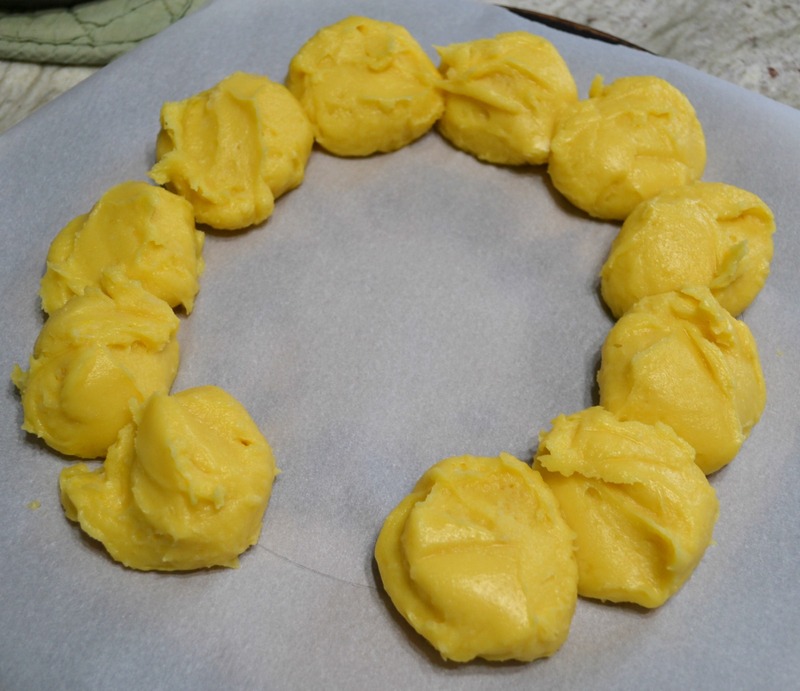 My mother was well known around town for the beautiful, light, airy, cream puffs that she made. She filled them with her homemade puddings or savory fillings. 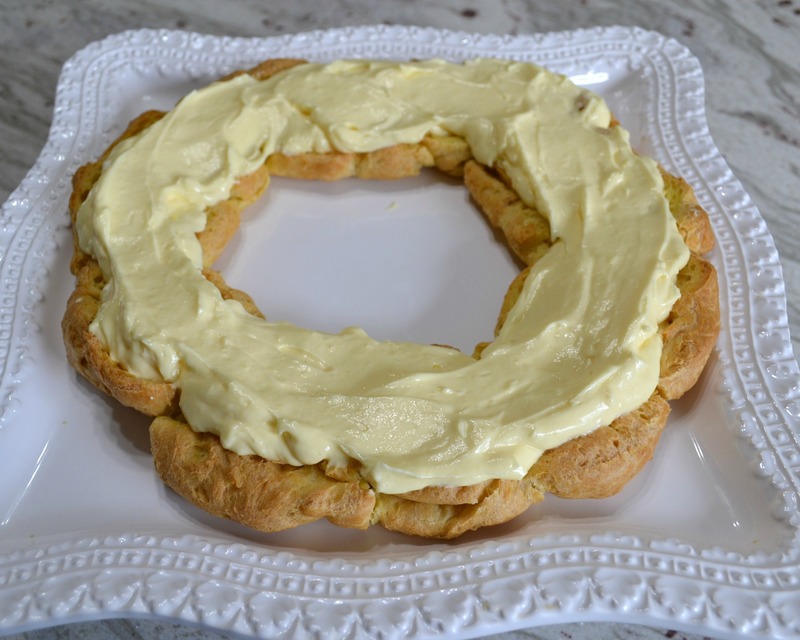 She ran across this recipe in an old cookbook and adapted it a little, to make the most elegant dessert ever. My grandmother was a lady that enjoyed just about everything, but when mom started making this, grandma requested it for every occasion we were together. In later years before she passed away, I remember that mom made this for her. I cried when I saw this recipe last week. 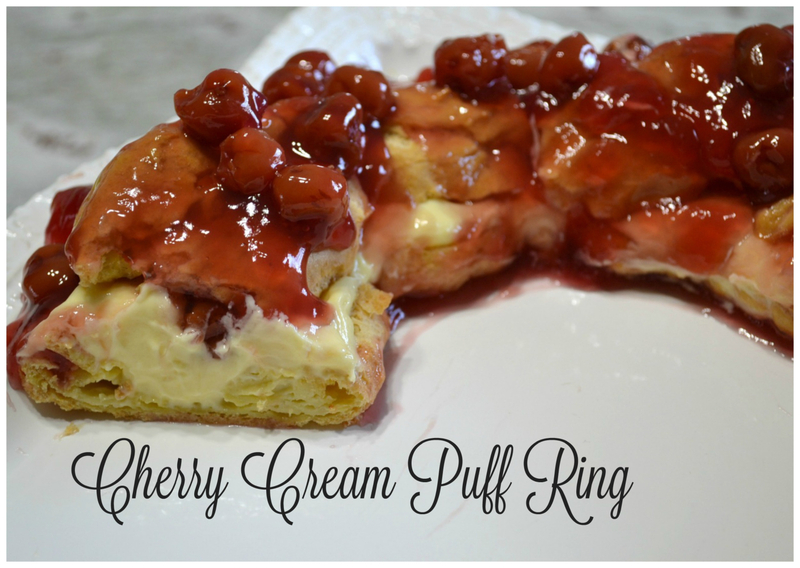 I decided that I had to make this Cherry Cream Puff Ring in honor of the two beautiful ladies that I Iove and miss so much. I must admit that I almost cried again, trying to make this! 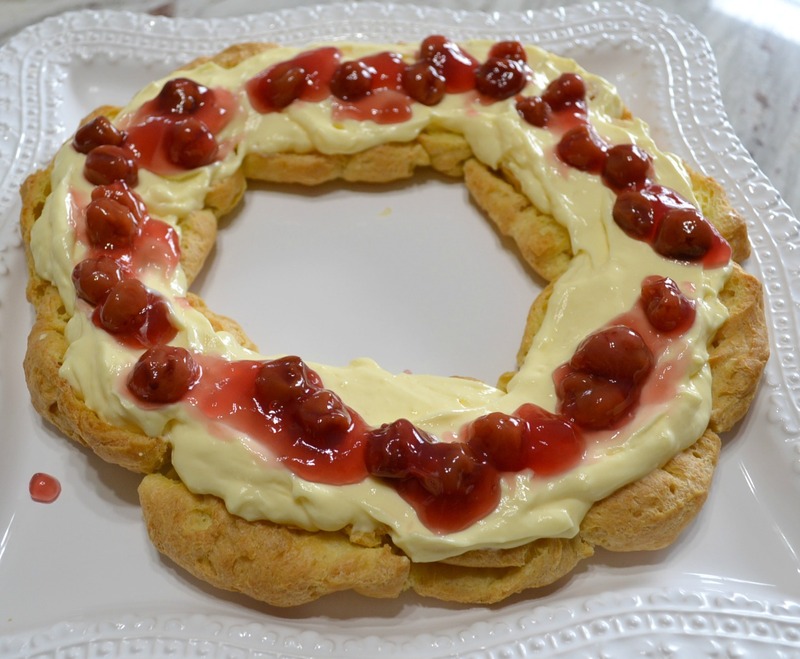 I do not have my mother’s natural ability to make this delicate dessert. I tried making the ring 4 different times, and they all failed. My ring looked beautiful until it cooled, and then it went flat. 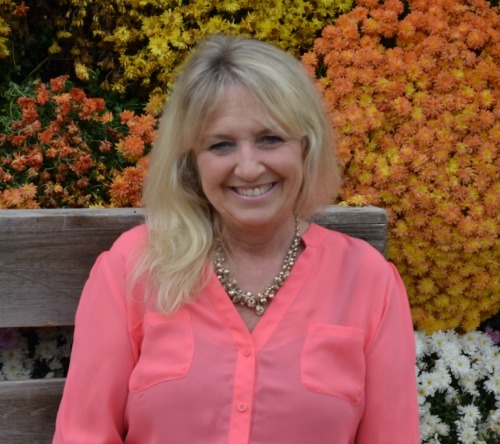 I asked my Facebook friends for advice and received the best tips. Here is how I made this. It did not turn out as it should be, but this was my 5th attempt so I gave up. It tasted delicious though. I did enjoy thinking of my mother and grandmother while making this. Heat the water and butter, stir in flour. Remove from heat, add eggs, 1 at a time. 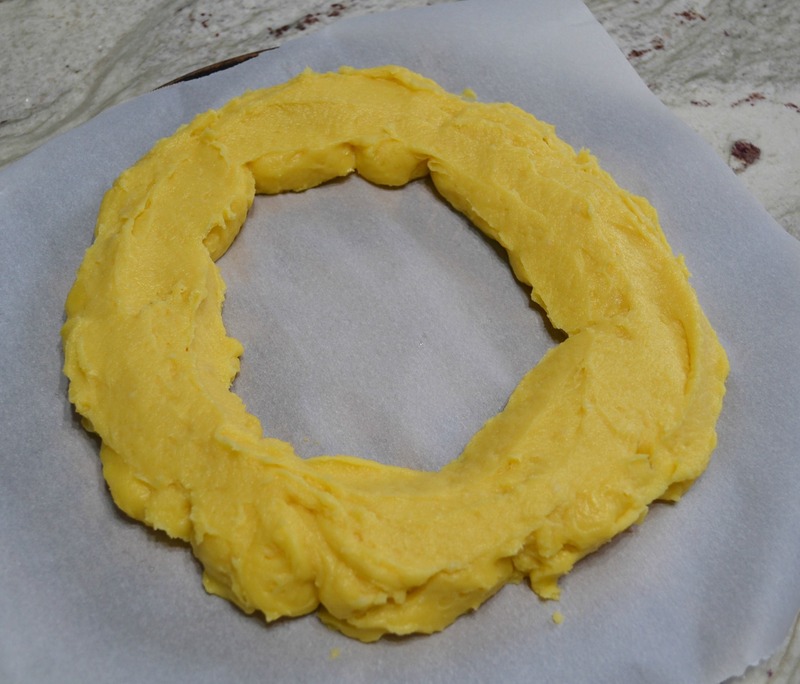 Drop dough by tablespoons to form a ring. Bake until puffed and dark golden brown. Place on cooling rack. Cut slits into sides to release steam. 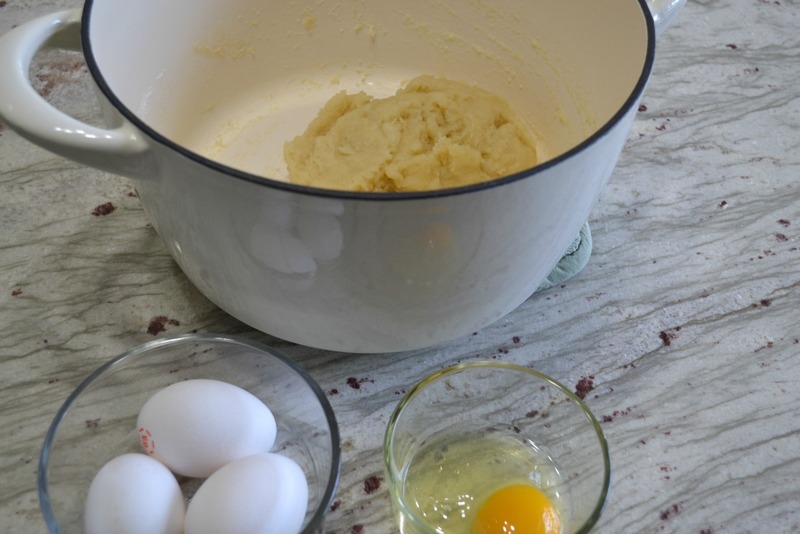 Cut off top and remove any moist dough. 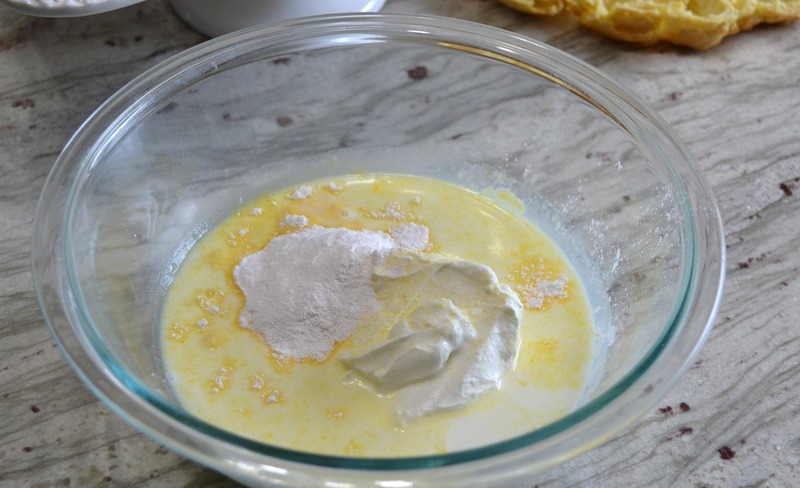 Combine milk, sour cream, pudding mix, and extract. 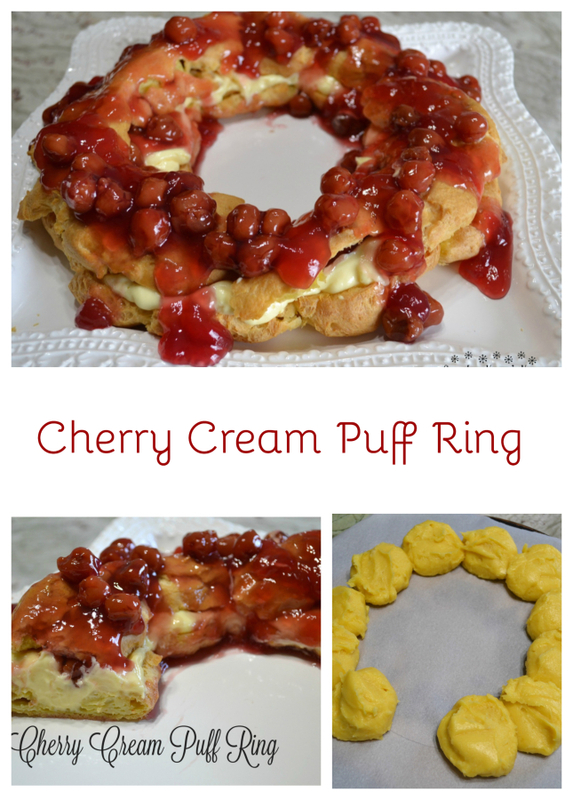 Fill cream puff ring with pudding and some of the pie filling. Replace top and spoon remaining pie filling on top. Refrigerate until ready to serve. Cut into pieces. 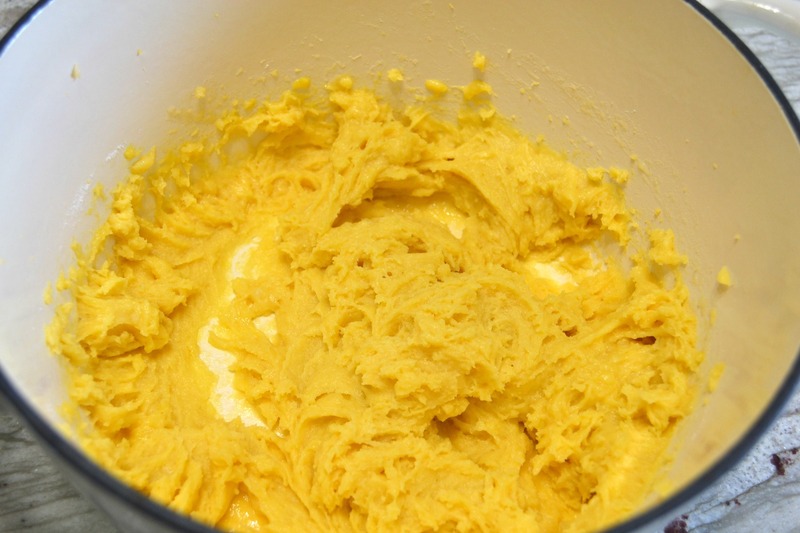 Preheat oven to 425 degrees F. In a medium size saucepan, bring the water and butter to a boil; stir in the flour. 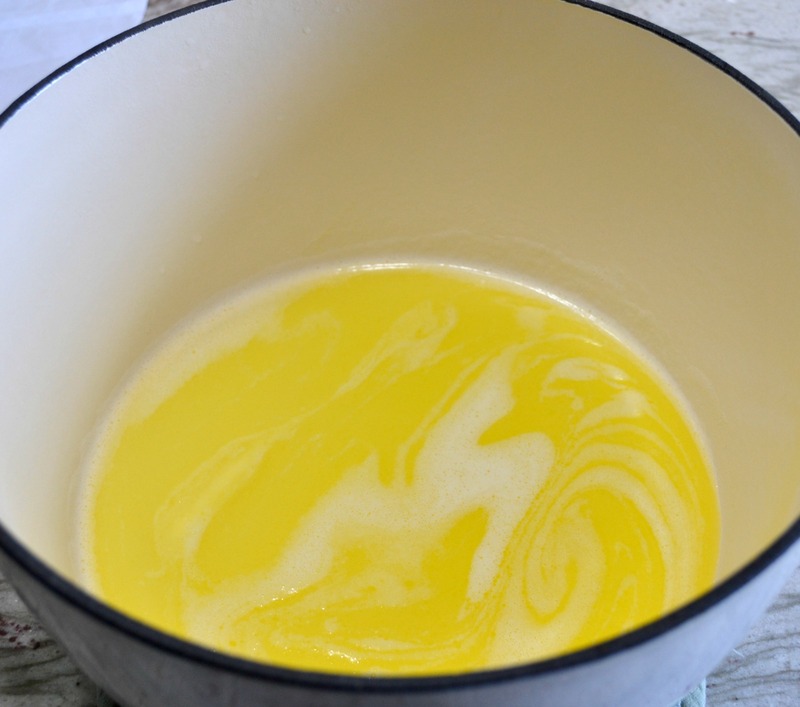 Stir vigorously until mixture forms a ball, about 1 minute. 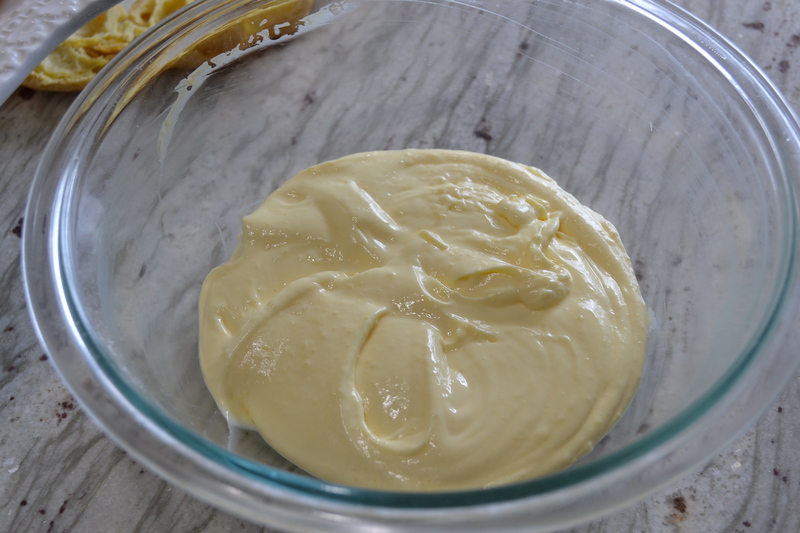 Remove from heat and add eggs, one at a time; beat until smooth. 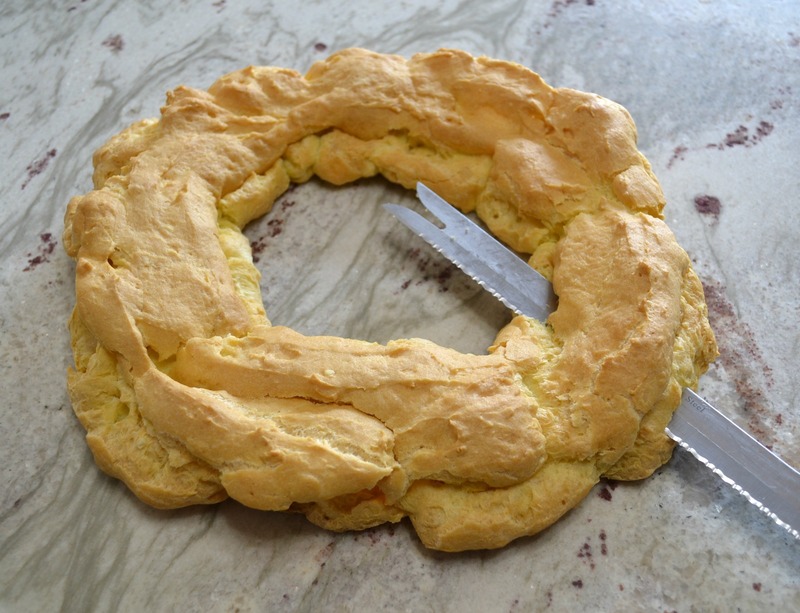 Drop dough by tablespoons onto parchment lined baking sheet, to form a 8-inch ring. Smooth with offset spatula. Bake until puffed and dark golden brown. Bake 10 minutes at 425 degrees then reduce heat to 350 and bake 25-35 minutes. Transfer to a cooling rack, cut slits in sides, and allow to cool completely. 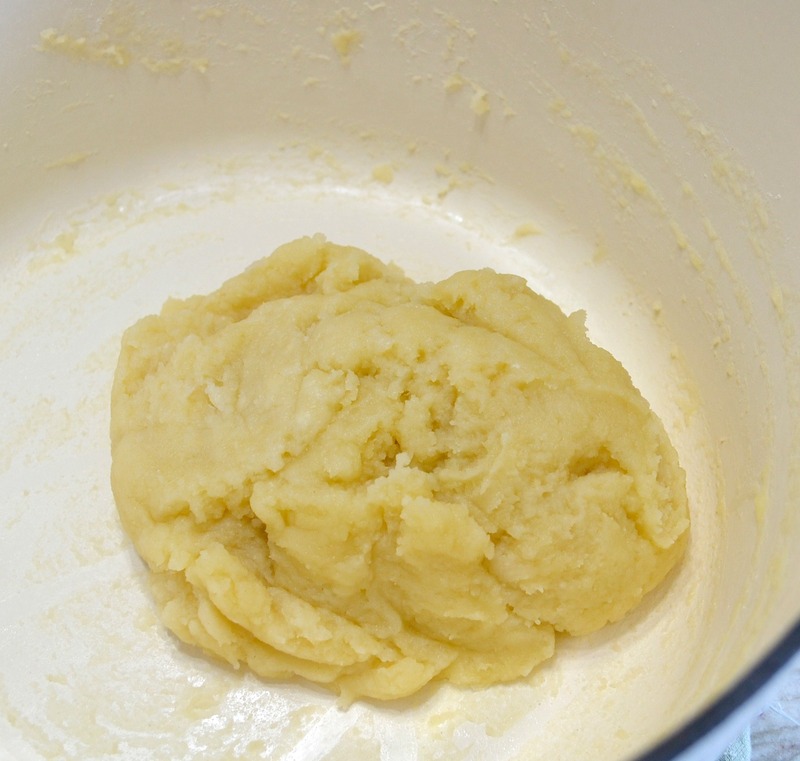 Cut off top with sharp knife; pull out any soft dough. In a medium size mixing bowl, beat together the milk, sour cream, pudding mix, and extract, on a low speed until blended, about 1 minute. Fill ring with the pudding mixture; spoon 1/2 cup of the cherry pie filling onto pudding mixture. Carefully, replace top of ring and spoon remaining pie filling on top. Refrigerate until ready to serve. Serves 10-12. A suggestion in the cookbook said to draw an 8 inch circle on the parchment paper to use as a guide for dropping the cream puff material. We prepare food with love for the people in our life that we love. This recipe was shared on Weekend Potluck @ Sweet Little Bluebird. awwww……Interesting that when I saw this in FB I was immediately reminded of my own mother’s “cherry cheesecake.” It was essentially a “dumping” of canned cherries on a layer or two I don’t recall. She wasn’t a cook, so I imagine this is why she was so proud of the reaction it always received. Your effort looks great to me, but you could look at this recipe as something only intended for mom and grandma to make to perfection. What a sweet story of the bond between all three of you! Thank you. I love recipes with stories behind them. I started not to even post this, but it means a lot to me, even if I can’t make it like she did. 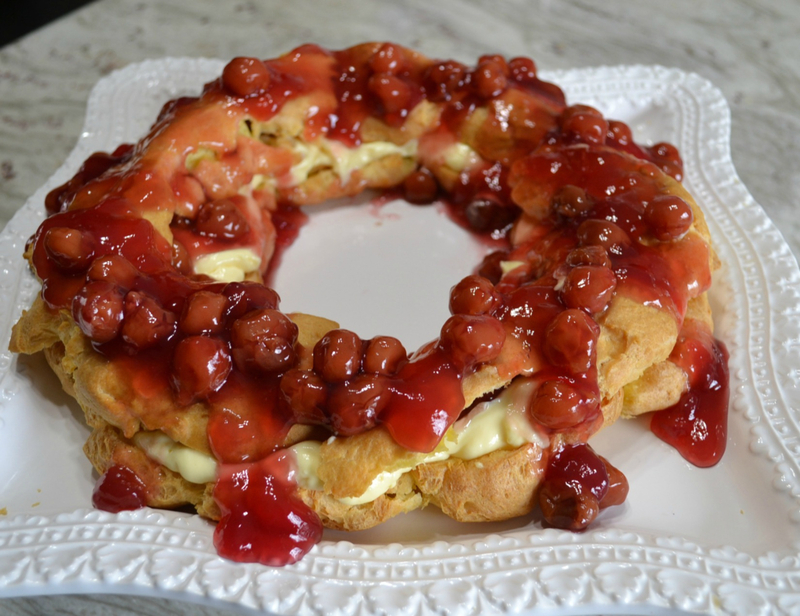 How wonderful that you have her recipe and cherries are my favorite! I remember making something like this the first year I was married only in my memory it took 10 eggs so I never made it again! We were newly weds and on a strict budget. So you brought back a fun memory for me, too! I definitely have to try your recipe. Let you know how it turns out! This is sweet. Wow 10 eggs! I bet it was delicious though. It’s making my mouth water. Yum! Thank you. 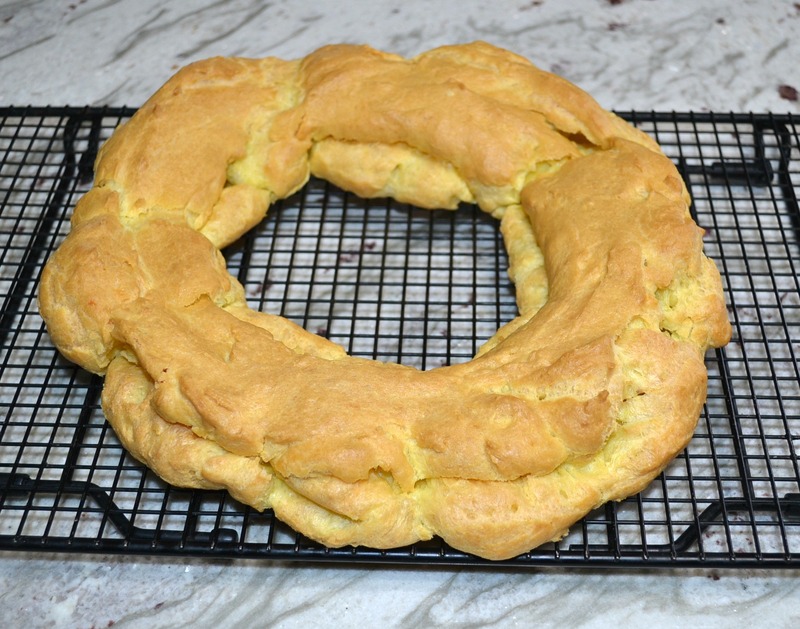 It does taste good, but I am still under baking it, but maybe I will try again sometime! It looks great and I know it tasted great too, although you say it was your 5th attempt and it didn’t turn out as it should be. Happy for you that you found the recipe 🙂 Thanks Pamela from Grammy Dee, #WednesdayAIM #LinkUp #BlogParty, social media shared.